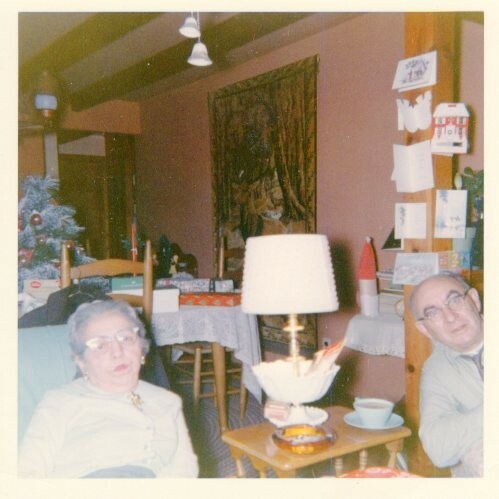 Grandma and Grandpa Allen (Margaret Blekkenk Allen and Arthur Allen) enjoy a warm fire in Uncle Art and Aunt Bernie's home (Arthur Allen Jr. and Bernice Streb Allen) on Huffer Road around Christmas time 1965. Christmas cards hang on the post behind Grandpa, and presents and a tree are visible behind them. This photo was processed in January 1966. Thanks to Aunt Bernie and cousins Jackie, Andrea, and Chris for sharing this photo with us!